Rare Gustavsberg Studio hand, horse and man by Stig Lindberg, Swedish ceramist. Size: 21 cm. long, 20 cm. high. Stamped. In perfect condition. Rare Gustavsberg studio hand, horse by Stig Lindberg, Swedish ceramist. Size: 16 cm. long. 13 cm. high. Stamped: Gustavsberg, and with studio hand. In perfect condition. Centrepiece, Stig Lindberg, Gustavsberg studio. Measure: Height 9 cm, 23.5 cm in diameter. Signed with "studio hand". In perfect condition. 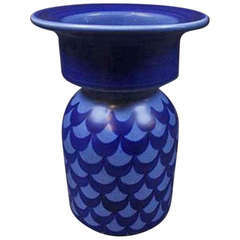 Vase, Stig Lindberg, Gustavsberg studio. Height 18.5 cm. Signed with &quot;studio hand&quot; in blue, and KG / MH. In perfect condition. Vase, Stig Lindberg, Gustavsberg studio. Measures: Height 18.5 cm. Signed with "studio hand" in blue, and KG / MH. In perfect condition. Great stoneware vase by Stig Lindberg. 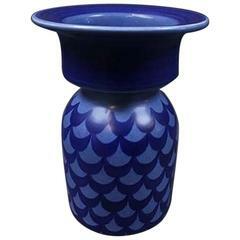 Beautiful blue glaze with a graphic fish scale pattern. Fully signed indicating it was made in 1967. Stig Lindberg, Gustavsberg, Domino vase in ceramic. Very good condition. A midcentury ceramic ashtray (plate) designed på Stig Lindberg and produced by Gustavsberg. This piece is in good vintage condition with some smaller signs of usage on the sides. Large vase in hand painted faience by Stig Lindberg for Gustavsberg Studio. Lindbergs began painting faiences in the early 1940s together with Wilhelm Kåge. Rare ceramic bowl designed by Stig Lindberg. Produced by Gustavsberg in Sweden.